I headed to Elisir for its first dinner post soft-opening, and was pleasantly surprised there were no signs that the restaurant in Penn Quarter had literally just opened its doors that same week. The staff was beyond attentive without being intrusive and knew the menu cold. The lighting was bright and refreshing, and the open kitchen area was amazing. 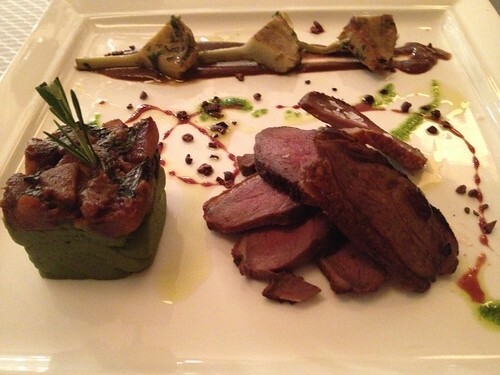 Basically, Elisir lived up to Italian fine dining as billed, without being pretentious or stuffy. Chef Enzo Fargione is on his game. 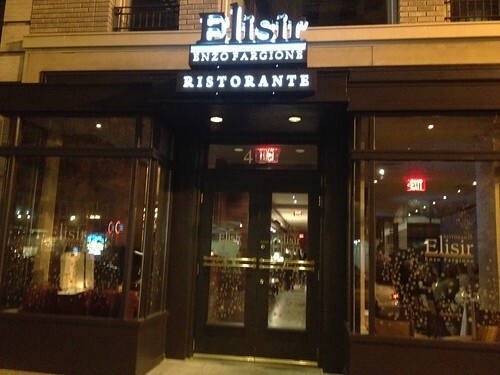 The former chef of Teatro Goldoni on K Street is the model of concentration at Elisir. There’s no yelling in the kitchen; it was almost serene. Surprisingly, I didn’t feel like going the tasting menu route…I think I’ve been a bit overwhelmed by the whole culinary journey craze as of late. At Elisir you’ll find for dinner a seven-course $75 tasting menu, and 10-course $95 menu, but I went for the a la carte. Forget all the talk about the water at Elisir costing 29 cents, I was more surprised about having to pay for olive oil. 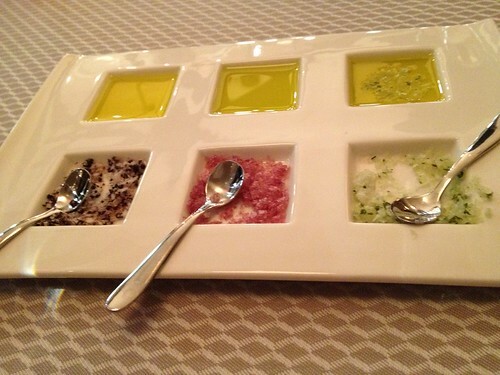 I quickly got over it when I dipped the bread in the mix of the specialty salts with the oils. The in-house bread was great – worth it, especially with the tomato focaccia. I had the octopus dish for my appetizer and it was probably the best I’ve ever had in my dining years. It was perfectly charred on the outside but tender on the inside. 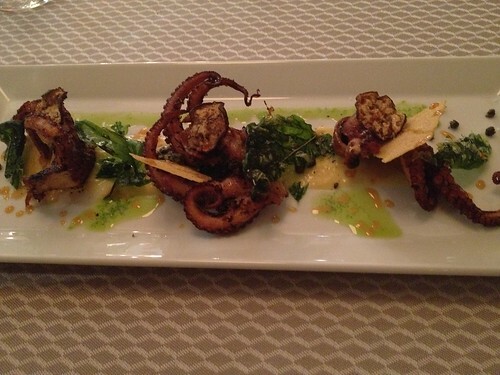 The problem with octopus is that it can sometimes end up too chewy – not the case here. For my entree I tried a pasta dish: black squid ink and saffron pasta sheets with a ragu of Maine Lobster and tomato confit. 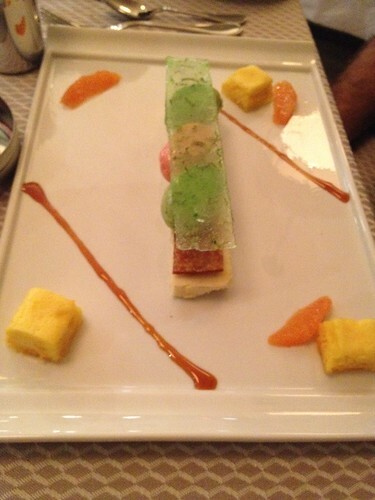 It tasted great, but I thought the presentation was a bit off compared to everything else I had seen, and looked messy. 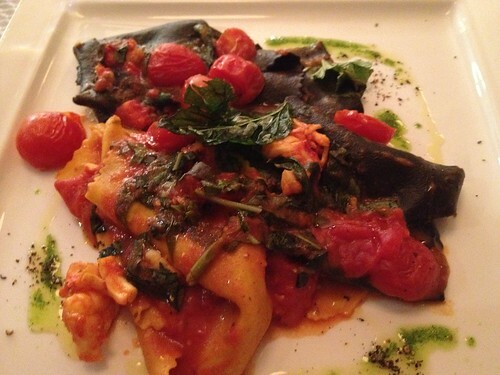 Though, to be honest, I might be in the wrong here expecting to see a beautiful dish of black squid ink pasta. 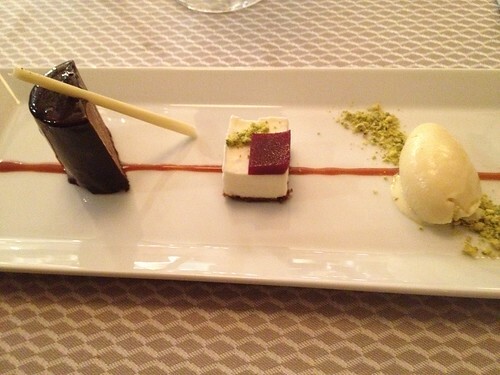 As I can’t ever leave a restaurant without going for dessert, I went for the chocolate plate and almost had to be carried out of Elisir thanks to Pastry Chef Elisabeth Barbato. Elisir Restaurant is on my new list of places to recommend to friends and people visiting DC. Elisir is located at 427 11th St, NW. The closest metro station is Federal Triangle (Blue/Orange Lines). For more information, call (202) 546-0088.